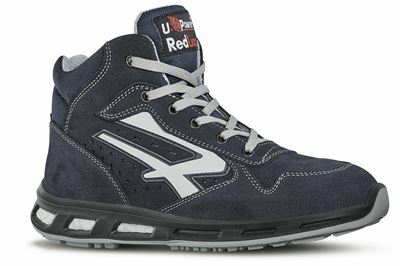 Safety shoe Upower redlion Moving. Redlion range. Lace closure. Redlion and Infinerdy technology by BASF will accompany you throughout your working day. This model will bring you comfort, ergonomics, energy saving and performance. The Infinergy damping saves energy much longer than with a traditional outsole. The safety shoe has a high coefficient of adhesion and an anti-fatigue effect. Upper: perforated soft velvet crust leather. Lining: Wingtex with breathable air tunnel. Tip: AirToe aluminum with breathable membrane. Antiperforation: Save and Flex PLUS, "no metal" anti-perforation sole. Comfort sole: Polysoft, anatomical sole made of soft polyurethane, breathable and antibacterial. Midsole: Flexible foamed PU and Infinergy from BASF. Shoes: Natural Comfort 11 Mondopoint. Produit conforme à la description, colis bien emballé et reçu rapidement.